If you think text messages are somehow obsolete, you might be thinking your marketing strategy wrong. Here are 10 key features to SMS that will explain why they’re worth investing in. In the buzz of mobile marketing, instant messaging and proximity technologies, SMS is staying in the spotlight. Just take a look on a search engine to see for yourself: Gartner predicts that by 2019, 20% of the major international brands will abandon their apps in favor of a simpler and more direct communication system; while Google aims to revive SMS through a protocol called RCS (Rich Communications Services) using classic text messages also to send images and videos, create groups and much more. There is a constant buzz around SMS, demonstrating the ongoing interest in this channel of communication. In this post, we’ll be delving into the current state of text messages. We’re not taking sides with those declaring the downfall of the SMS, nor with those announcing their revival, but rather we’ll be exploring the features that make it a vital marketing tool. Worldwide, almost half of those who own a mobile phone (47%) only use it to make phone calls and send SMS. A study conducted by GSMA in 56 countries – representing 80% of the world’s population – reports that SMS is very popular even in places where smartphones and internet connections are widespread. Text messages are used more than apps such as WhatsApp in France, Belgium, United Kingdom, Russia, USA, Canada and Australia. SMS now has 25 years of history and although its golden age came to a close in the 1990s, it has retained some special features that distinguish it from other channels: first and foremost, its one-to-one communication potential. An email may end up in the trash without even being opened, and a Facebook post can easily be ignored with a simple scroll. The features of SMS, on the other hand, mean that they are opened in 98% of cases (Dynmark). Perhaps one of the secrets of SMS is indeed its textuality: 160 characters, like a tweet (more or less) but quiet, direct and without the sense of over-saturation found with message boards, inboxes, walls, etc. Many protest by saying that: “SMS Marketing is effective for companies now that the channel is not saturated. What will happen when the sending volumes increase and SMS boxes become just as crowded as email inboxes?” This means that the channel will have reached full maturity and awareness. And as this awareness gives rise to experimentation, SMS Marketing will evolve even further to increasingly refine the resources at its disposal. Let’s take a look at these SMS resources to highlight the main features specific to this channel. Once delivered, the SMS is opened almost systematically. The figures do the talking: the SMS channel ensures open rates above 98%. And of this 98%, 90% occur within three minutes of delivery (Dynmark). These figures position SMS as a real-time marketing channel. It is no coincidence that customers’ preferred methods of customer care include support via SMS. There are several ways of using SMS to manage consumer relations -to request feedback, receive support, send reminders, and more. It may sound peculiar, but this term is more than appropriate. Its supporting devices make SMS truly omnipresent: the smartphone (or the old-generation mobile phone) is the everyday accessory that many consider to be “the true piece of proximity technology” that we always have on hand, like our wallet or house keys. SMS is omnipresent because it reaches the recipient everywhere and at any time of the day, because it does not depend on having an internet connection. Let’s think about the overall importance of transactional mailings for companies to communicate in a timely manner and improve the customer journey: The SMS Advantage study by SAP & Loadhouse highlights how 64% of consumers believe that SMS improves their user experience. The customer journey is made up of moments and touchpoints – meaning the various elements of the business relationship with the customer. Looking at the diagram, we can see how SMS can cultivate all touchpoints through targeted communication. A sense of completeness that text messages share with email. The hotspots of the customer journey are the ones in the middle, from the understanding to the maintenance stage: It is here where SMS makes the biggest impact in supporting purchases and building loyalty. 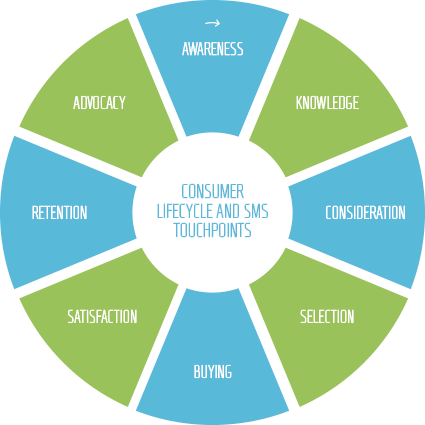 However, as we develop an SMS Marketing plan, we can see how text messages cover the entire customer life cycle. This feature has two aspects: one being targeted at brands, who can personalize the messages making them recognizable, thanks to a text alias to replace the phone number; and the other is targeted at recipients, through segmentation features and dynamic fields, making it possible to customize the SMS based on each contact’s activities, interests and personal information. Not forgetting the option to link up to three text messages to give your communications greater scope. Thanks to APIs (SOAP and REST), web service and FTP batches, the SMS channel can be connected to any CRM, e-commerce, ERP or content management system. This is an essential resource to create an exchange between customer information and data, by connecting the various technologies and setting up a digital ecosystem. Within a digital strategy, the best partner of SMS campaigns is email, which complements the text messages. The trick is being able to coordinate these two channels into a single stream, which we’ll talk about in the next point. We all know the name: Marketing Automation. Yet there are still a small number of brands that put it into practice or are familiar enough with it. It is technology that allows you to have an automatic workflow of emails, SMS and more: not only a way to save time and make the flow of communications independent, but it also lets you create relevant and targeted campaigns, automatically gear content and messages (welcome, confirmation order, promotional messages etc.) in line with the recipient’s personal information, interests and behavior based on previous communications. Anyone sending an SMS can have in-depth information about delivery and failed delivery percentages, and openings such as clicks on links in the message, not only by campaign but also by recipient. Link traceability with SMS in particular is a fundamental tool to find out who clicked the link and how many times they repeated the action. What’s more, recipient-based reports provide you with information and statistical data that you can use to develop a filter, create a new group of recipients or even establish a condition (as accurately as possible) for triggering a workflow. Besides the ability to link messages, as mentioned earlier, landing pages are a key resource for SMS, where customers can read about products, innovations, services and communications that are introduced in the 160 characters of the SMS. All you need is a drag & drop editor to create a professionally designed page that’s optimized for mobile devices. Once you’ve created your landing page, just shorten the URL with a URL shortener program (often integrated in the mailing platform) and then insert this traceable link in your SMS. Schedule the delivery to choose the day and time when your recipients will automatically receive your communications. Set up “do not disturb” time slots, to avoid nighttime deliveries or certain days of the week. Pause and resume sending, to suspend your campaign, amend its content and resume it at any time. The ROI for SMS Marketing is one of the highest in the field of digital marketing. Leaving aside the numbers and percentages floating around the web – which are often unreliable or out of date – we’d like to show you our case study where we analyzed Loytrend’s SMS Marketing Strategy by exploring their objectives, strategy and results, armed with percentages and figures. To explore the resources of SMS Marketing and look at the channel from different angles, you’ll find the dedicated section of our blog, which is constantly updated with vertical and horizontal content. Then, if you’d like to progress from theory to practice, give MailUp a try by activating a free-trial platform.